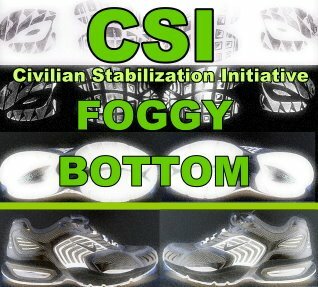 The Bush Administration’s 2008 Civilian Stabilization Initiative (CSI) called for a Civilian Reserve Corps of 2,000. The Congressional Research Service reports that S/CRS has grown from a few dozen to a staff of 112, as of January 30, 2009. Here is the break-down of the current staffing: 36 Foreign Service officers on one-year tours, 22 State Department permanent civil service employees, and an additional three State Department personnel on detail. Another nine are on detail from other executive branch agencies: Commerce (1); Justice (1); Office of the Director of National Intelligence (1); USAID (2); and DOD (4). (Of the four from DOD, one is from the Joint Staff, one from the Office of the Secretary of Defense, one from the Army Corps of Engineers, and one from the Air Force.) In addition, 36 contractors work for S/CRS, as do six fellows and interns. In June 2008, Congress specifically provided $75 million for S/CRS and USAID S&R activities, including the establishment and implementation of the civilian response capabilities, in the Supplemental Appropriations Act, 2008. This funding apparently expires on September 30, 2009. As of January 30, 2009, it is unclear how much funding S/CRS will receive in regular FY2009 appropriations. The S/CRS mission? To lead, coordinate and institutionalize U.S. Government civilian capacity to prevent or prepare for post-conflict situations, and to help stabilize and reconstruct societies in transition from conflict or civil strife, so they can reach a sustainable path toward peace, democracy and a market economy. The whole CRS report is here (pdf) including background of this initiative. You can check out the S/CRS vacancies here; the list of active component vacancies is also here. Note that the active component officers of the Civilian Response Corps are full-time employees of their departments/agencies whose specific job is to train for, prepare, and staff reconstruction and stabilization (R&S) operations and conflict prevention and mitigation efforts. Officers may spend up to 60% of their year in conflict areas on deployments averaging 3 months. CRC-A members will attend up to eight weeks of formal training and exercises per year.